What great news we get to share for Savory Bite number 50! 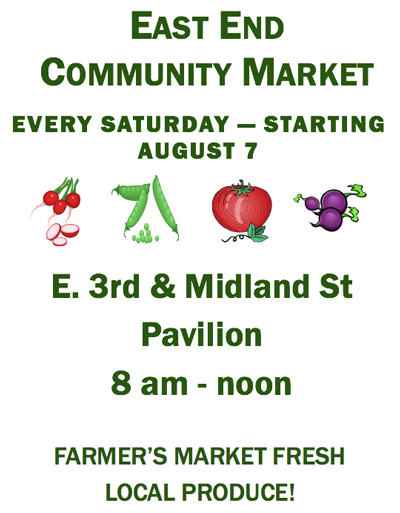 This Saturday, Lexington gains a new market for locally grown foods and (I think, eventually) other items. After years of work, the East End Community market opens at East Third and Midland. Market hours will be 8 AM - 12 noon every Saturday through the growing season. Getting a new market going requires leaps of faith by producers and buyers -- but the local food growers have to leap higher and farther. They do 90 percent of their work before ever arriving at the market location to see who is interested in their products. They grow on spec. Encourage these pioneering growers by buying some produce this weekend. Once the growers know they have buyers, they will plan and plant more, and the offerings will expand. It's quite a dance of trust and testing, the launch of a new market. The same kinds of trust and investment and testing may also extend to artisans and crafts people who will eventually take part in this Market. How exciting to get to be part of it! As far as I know, this is Lexington's first explicitly "community" market. Wouldn't it be grand to have community markets throughout the city? This one comes with a market amenity -- its own pavilion, built some years ago when Community Ventures Corporation renovated the building on this site, in anticipation of a market use. Congratulations to the many who have worked hard to make this market happen. I don't know who they all are, but I appreciate the effort so much, and expect the East End Market to grow into a linchpin of East End vitality. I expect the Market will have many positive impacts on East End cultural, economic, and physical well-being. The world is coming to visit central Kentucky this year for the Alltech FEI World Equestrian Games. To help our visitors know more about Kentucky's food and food ways, Savoring Kentucky is rolling out 116 Savory Kentucky Bites, one for each of the 100 days before WEG begins, and 16 for the days during WEG, September 25 - October 10. Today's Savory Bite is number 50.